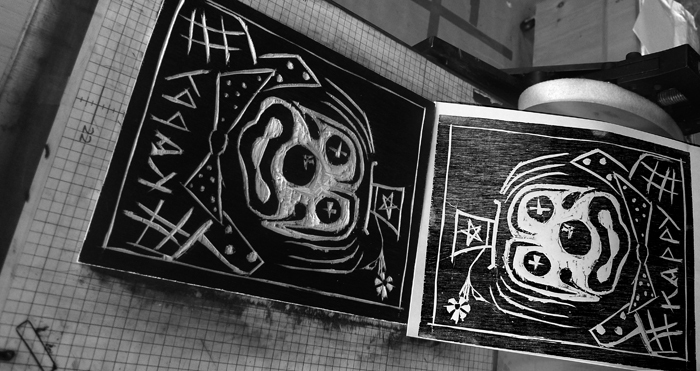 Saturday November 8 – Sunday November 9, 2014: woodcut workshop for beginners – Learning cutting on wood to create an image and printing it – a two days bilingual French/English workshop. ‘Woodcut ‘ is just the English name use to ‘label’ the technique we are trying to master, the French use the word “gravure” [ engraving], the Italians the name “ incision ” [ which in English as been appropriate mostly as a surgical term] , from the Latin “incidere”, according to the dictionary means “cut into”… as simple as that! So, we are going to “cut into” the wood panel [ in this case plywood] and learn how to create, first a “cutted line”, then letters and finally an image. In any case we are confronted with a two choices challenge, creating ‘positive’ or ‘negative’ lines . Basically when a piece of wood has been “cut” or carved, it has its one entity, life – by its nature it is a 3 dimensional art work. Thank to the so called “printing” process we are able to create a ‘mirror’ image of it in 2 dimentions one. This involve appling a ‘wet color’ [ in this case black] to the part that have not been ‘carved out’, covering it with a piece of paper and then applying enough pressure on it so the ‘wet color’ would be able to transfer itself into the paper. 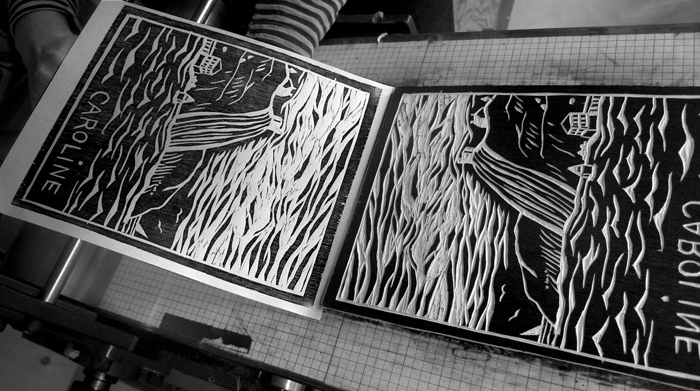 Creating what is called a “print”, or more accurately said, a “wood cut print”. In this case to achive this result we have used a “printing hand press”. Cutting on wood is an intense procedure, sometimes event it can become a frustrating one, more so if one tackles an unknown material behavior under the pressure a cutting blade. 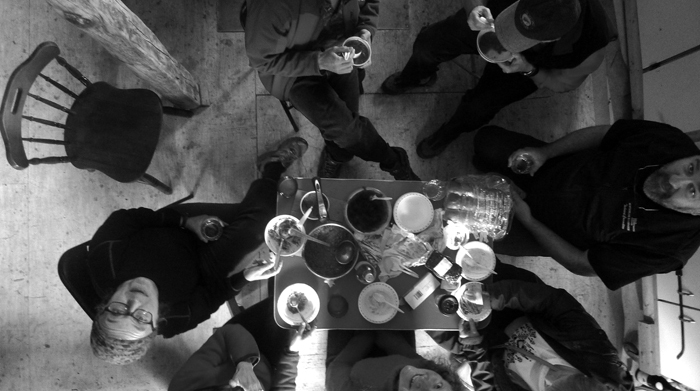 Sharing food and drink help to release physical and mental tension ! Thank you Aphrodite, Caroline, Sophie, Chris, Christian, and Kappy for accepting to challenge yourselves with a difficult graphic material of expression … and challenging me as well! Bloch junior cuts his block – a mini workshop on how to translated a carved surface image into a piece of paper. 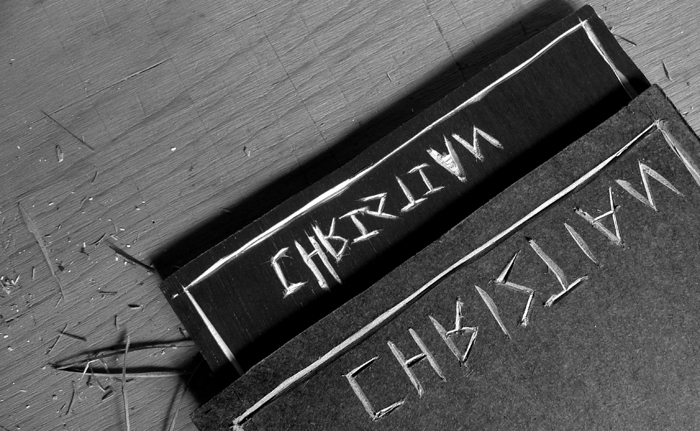 “Carving Project” two – Parsons The New School for Design, New York.